When it comes to covering Israel’s efforts to rein in the rocket barrage that Hamas and other Islamist terror groups in Gaza have been directing at Israeli towns for years, the western media like to focus on stories and images that highlight the suffering of Palestinian civilians. As acknowledged in several Washington Post articles published during Israel’s November 2012 campaign against the activities of Gaza terror groups, this entails a more or less open appeal to emotions. 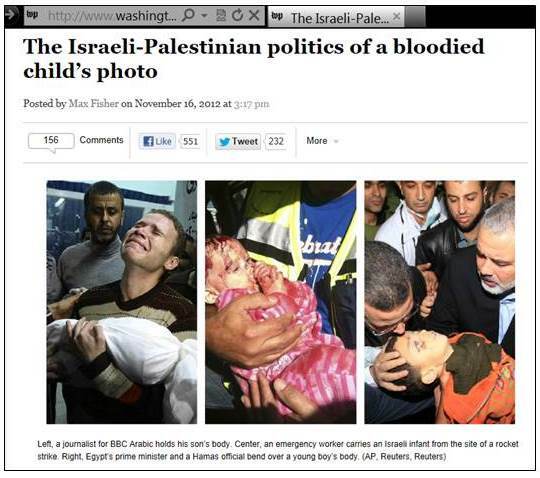 Another related article by Max Fisher was devoted to “The Israeli-Palestinian politics of a bloodied child’s photo.” In addition to the photo of the grieving father from Gaza, Fisher contemplated two other images that showed a dead Palestinian boy and an injured Israeli girl. To put it cynically, Fisher has a point: it would obviously be quite “messy” to squarely deal with the fact that all the three images – which, according to his own characterization, “defined … the renewed fighting between Israel and Gaza-based Hamas” – really showed the victims of Palestinian rockets. But cynicism aside, it is downright obscene to suggest that it would be much “purer, cleaner, lower-risk” to let the “emotional power” of images of dead children work its magic. One just has to recall the hatred and fanaticism incited with the al-Durah-footage from 2000 to understand why some critics call this approach “lethal journalism.” One could also argue that less emotion and more reason would easily produce the realization that there wouldn’t be any photos of wounded or killed children from Gaza if Palestinian terror groups stopped using the territory they control as a launching pad for mortars, rockets and terror attacks on Israel. The media’s eagerness to elicit empathy with Palestinian suffering is also problematic because there is plenty of evidence that confrontations with Israel are rather popular among Palestinians – and needless to say, this evidence is generally ignored. It is noteworthy that Palestinian enthusiasm for firing rockets from Gaza was obviously not diminished by Israel’s unilateral withdrawal from the territory in September 2005 and the fact that in spring 2006, Israeli voters handed an election victory to the Kadima party that had been newly formed to promote the disengagement from Gaza and additional withdrawals from the West Bank. In this context, it should also be recalled that just two months earlier, Palestinian voters overwhelming endorsed Hamas. When she passed away in mid-March, she was reportedly honored not just with a full military funeral and a eulogy by Hamas Prime Minister Ismail Haniyeh, but also by words of praise and appreciation from Palestinian officials in the West Bank. How many Palestinians really share the gruesome views of “Umm Nidal” is debatable, but given the pervasive glorification of “martyrdom” achieved through terrorism and “jihad” in Palestinian society, she can hardly be dismissed as a fringe figure. A rare glimpse of this widely ignored reality could be caught when New York Times (NYT) reporter Jodi Rudoren noted in a Facebook post last November that it seemed to her that Palestinians in Gaza were sometimes rather “ho-hum” about their casualties. Needless to say, Rudoren’s observation caused great outrage, followed by a swift apology on the part of the NYT, which assigned a social media supervisor to the appropriately contrite Rudoren. Rudoren clearly broke a taboo by making an observation that didn’t quite fit with the media’s mission to focus on Palestinian suffering caused by Israel. But another remark that doesn’t quite fit with this mission went largely unnoticed – perhaps because it was made in “The Gatekeepers,” a film that was widely praised for providing harshly critical views of Israeli policies and the fight against Palestinian terrorism. However, one of the film’s seven segments is entitled “Our Victory Is to See You Suffer” – and this title quotes a remark by the well-known Palestinian psychiatrist and award-winning peace and human rights activist Eyad Sarraj. According to Ami Ayalon in “The Gatekeepers,” it was Sarraj who explained to him during a meeting devoted to developing a peace initiative at the time of the bloody Al Aqsa Intifada that, irrespective of the price paid by Palestinians, they saw it as their “victory” to make Israelis suffer. As amply documented by the many polls and plenty of other evidence studiously ignored by the media, Sarraj was clearly telling the truth – though it is of course a truth that the western media don’t want to tell. First published at The Algemeiner. This entry was posted in Uncategorized and tagged Gaza, Hamas, Hezbollah, Israel, Lebanon, Palestinian, terrorism. Bookmark the permalink.